The woke Social Justice Warriors were out in full military regalia over Thanksgiving. It seems they were triggered after watching a Charlie Brown Thanksgiving that originally aired in 1973. 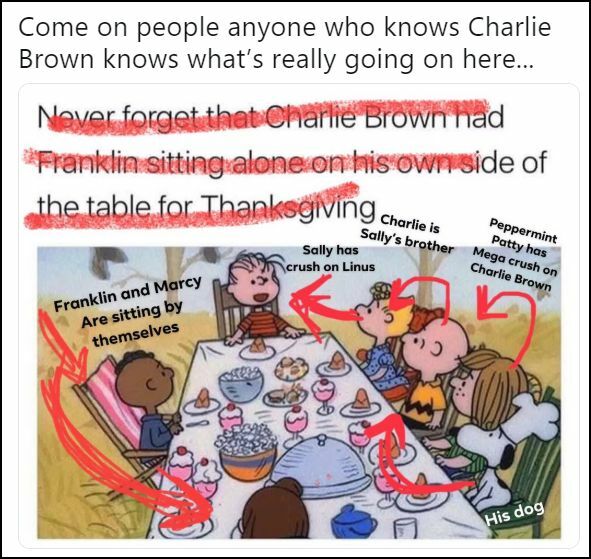 Franklin Armstrong, the only black child featured in the animated feature is sitting in a lawn chair alone on one side of the table. To the woke crowd, this is racism pure and simple because, as you know, everything is racist. I guess not having a “person of color” at the impromptu Thanksgiving celebration would have been better. I think what really triggered them, but they’re not saying, was that there was a call for prayer and the mention of God. Latest: Is the Bible the Original ‘Communist Manifesto’? 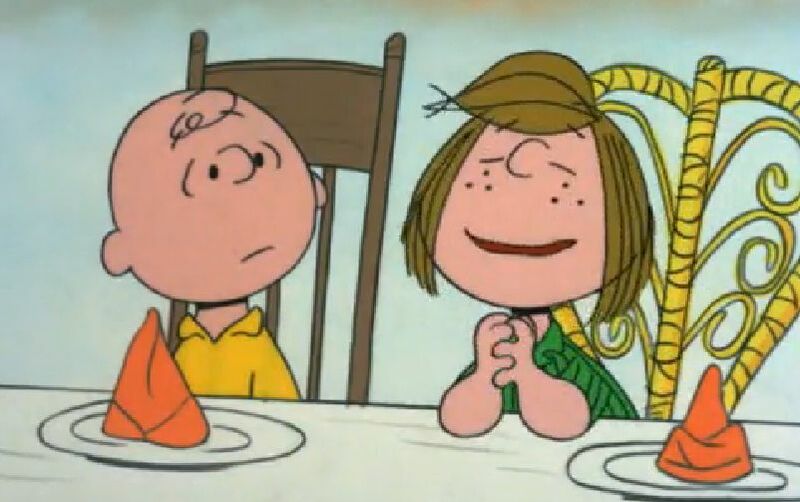 “Are we going to have a prayer?,” Peppermint Patty asks. “It’s Thanksgiving you know. Before we’re served shouldn’t we say grace? We thank God for our homes and our food and our safety in a new land. We thank God for the opportunity to create a new world for freedom and justice. 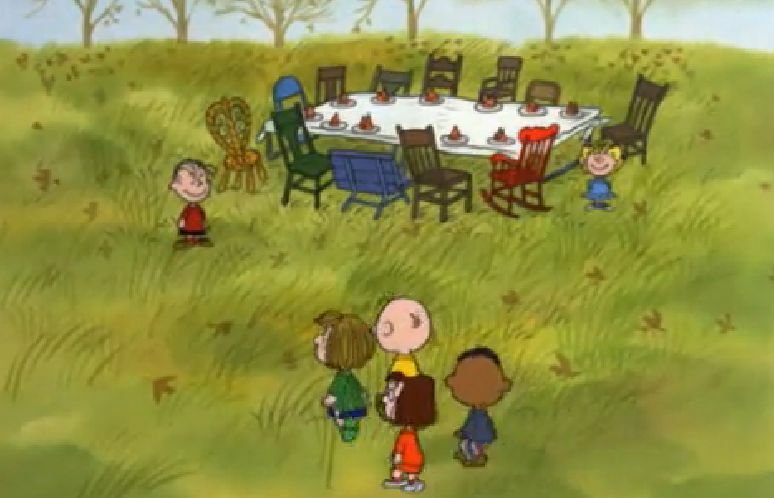 It’s true that Franklin is sitting on one side of the table alone in a lawn chair. Maybe he wanted to sit in the lawn chair. Maybe it thought it was more comfortable than the other chairs. A previous scene shows Snoopy taking a long time to get it to work properly. There are some scenes that show a number of different seating arrangements. This one shows them about to sit at the table. There is no lawn chair but quite a few other chairs. I don’t know how to explain the different seating arrangements. I doubt that anyone knows. 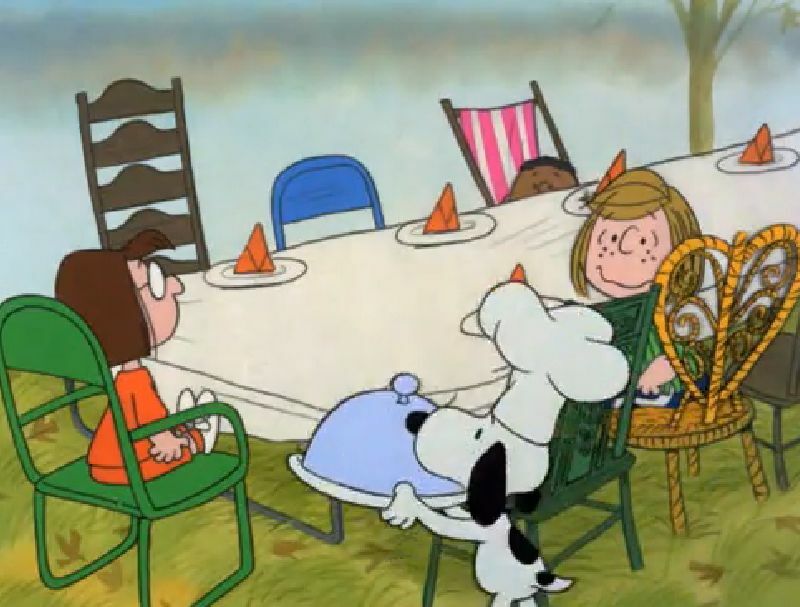 The fact that Peppermint Patty, who invited herself and Franklin to a Thanksgiving dinner that Charlie Brown had not planned, should have encouraged the SJWs. Charles Schulz was an early advocate of civil rights. The Franklin character was added to the comic strip on July 31, 1968, three months after the assassination of Martin Luther King, Jr., on April 4th of that same year. Martin Luther King Jr. had been dead 11 days. His assassination fresh on her mind, Harriet Glickman, a teacher raising three kids in suburban Los Angeles, sat down at her typewriter. 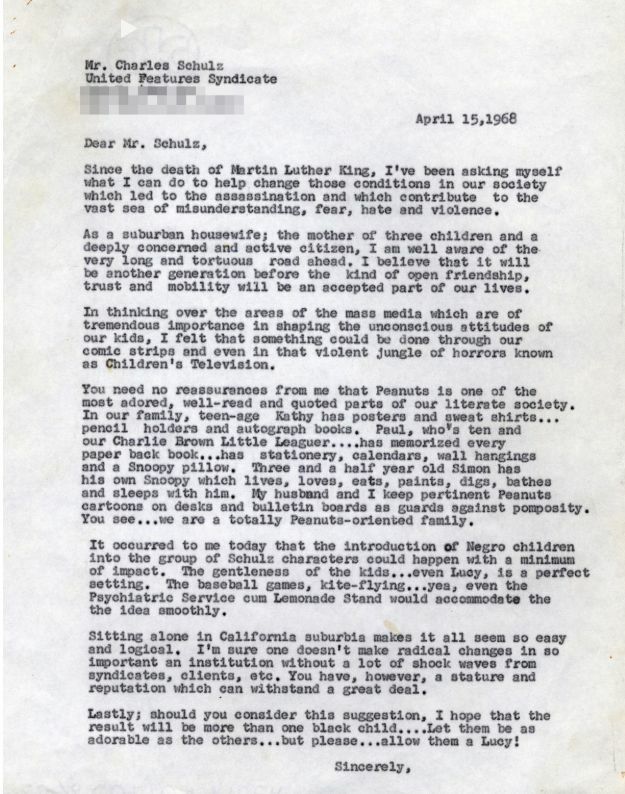 Glickman thought the creator of the popular Peanuts comic strip could play a small part in promoting tolerance and interracial friendship by including a black character in his strip. She sent off the letter, not expecting a reply. Schulz did write back, to say he had considered her suggestion. But he worried that if he created such a character, black parents might think he was condescending to their families. With Schulz’s permission, Glickman asked two of her black friends to send him some ideas on how to make a black character relatable. A few weeks later, the cartoonist responded. There’s Charlie Brown shaking hands with Franklin when he enters the house. 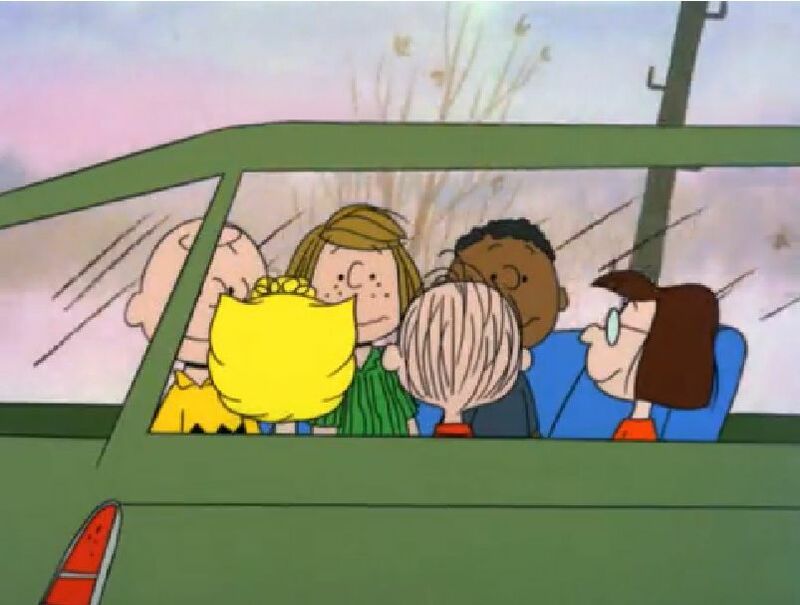 After the impromptu Thanksgiving dinner at Charlie Brown’s house, they headed off to his grandmother’s condominium. Notice that Franklin is one of the invited guests. 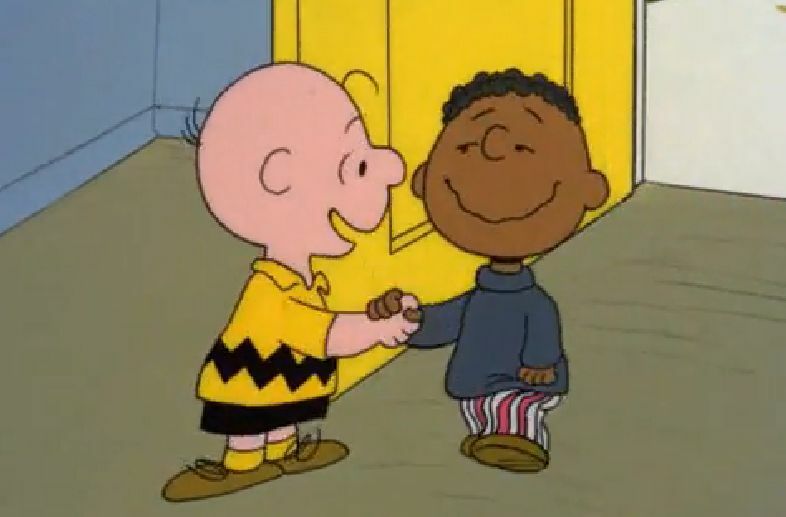 It doesn’t take a lot of effort to figure out that there wasn’t anything racist about Charlie Brown’s Thanksiving.